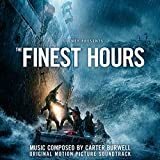 Accueil Produits Bande originale La bande originale de “The finest hours”. La bande originale de “The finest hours”. Sortie : 29 janvier 2016. 1. Meeting Miriam – 1:33. 2. It’s Starting to Snow – 2:22. 3. Pendleton Jump – 1:59. 5. Lost Our Lights – 1:26. 6. You Don’t Have to Come Back – 2:15. 7. I Hope You Didn’t Kill Us – 1:16. 9. The 36500 – 1:38. 10. The Bucket Line – 1:46. 11. That Man Shouldn’t Have Sent Them – 1:42. 12. Crossing the Bar – 4:30. 13. Pendleton Push – 2:30. 14. We’re All Alone – 2:22. 15. Four Men Lost – 1:28. 17. Big Man, Big Sea – 1:04. 18. The Going Down – 1:32. 19. Safe Harbor – 10:20. 20. Haul Away Joe (par Kodaline) – 3:32.